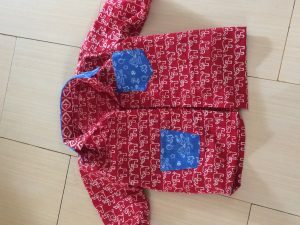 I made boy clothes lately. School ‘free’ uniforms, and now, pants. It’s not easy to make them the right way. Of course, it looks ok but actually, there were small mistakes and ‘imperfection’. It’s quite tricky to sew this kind of ‘seamless’ pattern on the opener side. I also forgot that my teachers once taught me wasn’t correct. I forgot to correct that when cutting the fabric. Well, it’s wearable alright but definitely not ‘correctly’ sew. My boys leg shape from waist to feet, they are thin. So bony TAT. It’s hard to make quite fit pants. The pants I made are still a bit lose on the leg but ok on the waist. I used stretch on the waist, too but if i didn’t use it, it was ok too. I used type of stretch band which has holes so we can control the length of stretch by slipping the button into one of the holes. 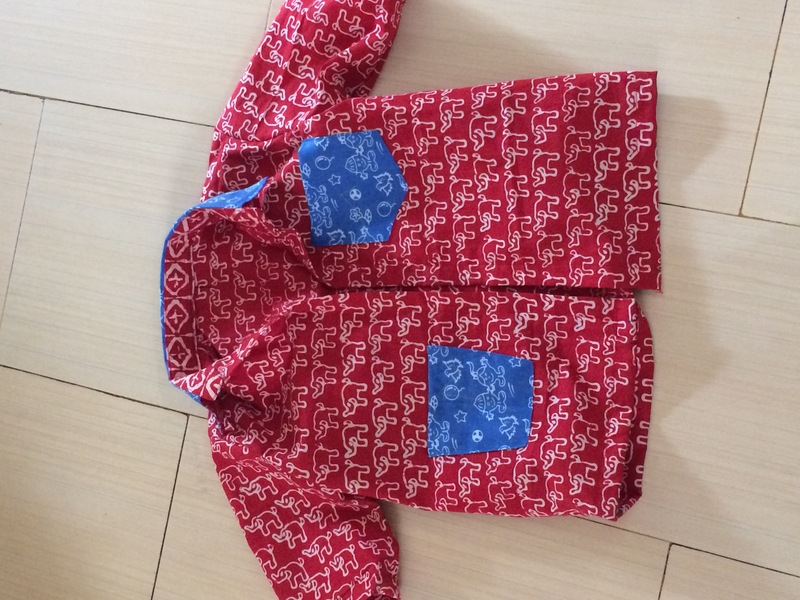 It’s a very good idea about using this kind of stretch for kids pants as they will growl and the stretch quality usually depreciates along with time. Yet, for ‘neat’ and very formal pants, I won’t use this. Haha. Although, it won’t be seen from outside, I don’t feel it’s 100% neat. Must take a pic and show the stretch band/tape someday and put it here. It may be difficult to imagine what kind of stretch or what kind of rubber i’m talking about.